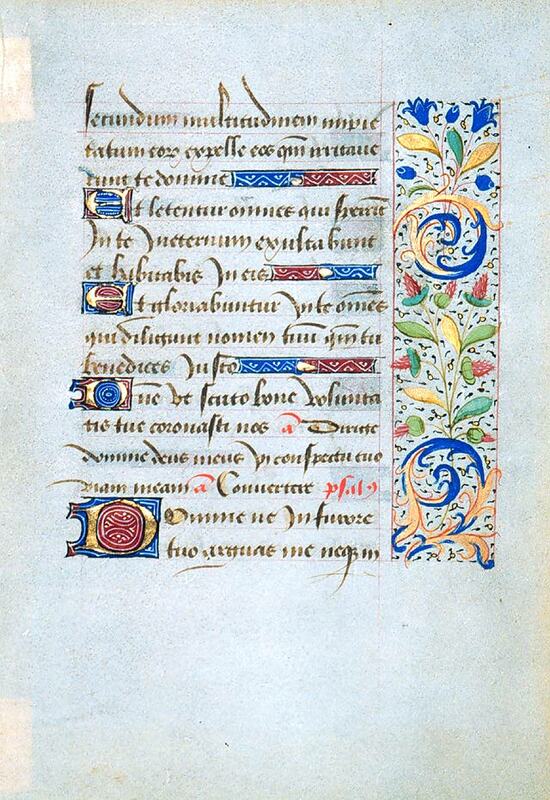 Text: This leaf contains text from the Office for the Dead at Matins, the First Nocturne (here, Psalms 5 and the beginning of 6). A scan of the verso is not currently available. secundum multitudinem impietatum eorum expelle eos: quoniam irritaverunt te Domine. Et laetentur omnes, qui sperant in te: in aeternum exultabunt, et habitabis in eis. Et gloriabuntur in te omnes, qui diligunt nomen tuum: quoniam tu benedices iusto. Domine ut scuto bonae voluntatis tuae: coronasti nos. Ant: Dirige Domine Deus meus in conspectu tuo viam meam. Ant. Convertere. Psalmus. [from Psalms 5] ...according to the multitude of their impieties expel them: because they have provoked thee O Lord. And let all be glad, that hope in thee: they shall rejoice forever, and thou shalt dwell in them. And all that love thy name, shall glory in thee: because thou wilt bless the just. Lord as with a shield, of thy good will: thou hast crowned us. Ant: Direct O Lord God my way in thy sight. Ant. Turn thee O lord. Psalm.